I always get a kick out of articles that summarize the year’s most popular corporate jargon. Having worked in a corporate setting for many years, I have heard (and, admittedly, used) many of the terms at one point or another. Come on, you have too. Admit it! Variations on “talent”: Talent Management. Talent Acquisition. Talent Retention. If I were to ask ten people what these terms mean, I’d probably get ten different answers. Unless one is actually in the “talent” business (and I’m not referring to America’s Got Talent, friends), one does not necessarily care about understand the “talent” business. If your organization has these roles, please make sure you explain to your new employees what they mean to your organization. Roles and functions and job descriptions and teams and objectives and priorities vary from company to company, from industry to industry. Bootcamp: When did everything become a “bootcamp”? By definition, a true bootcamp should be an intense, über-structured program, as the military requires. I have seen light workshops, webinars and even team-building events, titled “bootcamp”. Really? A couple of years ago, at the day job, I was asked to develop a 2-day – you got it – bootcamp, for some employees who would then be delivering their own – yes – bootcamp to another group of employees. The smart aleck in me couldn’t resist, so I lovingly (and a little sarcastically) titled the session “Bootcamp Bootcamp”. Fortunately, my crew had a good laugh about it! My point? Not everything is a bootcamp. Title your offerings accordingly. Any internal terms or acronyms that new employees have no context to understand: In the first days on the job, your new employees are lucky to remember the first names of the people on his/her team, let alone understanding all of your internal systems, processes, projects or industry terminology. If you can’t eliminate all of these terms from your onboarding program, define them as clearly as possible. Even better? Create a glossary of terms as a quick, go-to resource for new employees to refer to in a pinch during their first weeks. The term “onboarding” itself: Like “talent”, this is a made-up word that means little to those who are neither passionate nor involved in it. Many of our organizational stakeholders do not understand the difference between “orientation” and “onboarding”. HR systems refer to the automated paperwork process as “onboarding”, so it has morphed into this catch-all word that is used for pretty much anything related to the new employee experience. If we can’t explain the process clearly, how can we expect our stakeholders to support, or get involved in, the process? Communicate your program’s objective. Its purpose. The value it brings to your organization. Use clear language that anyone in your organization – entry-level to C-suite, new or tenured – will understand. If it’s been awhile since you’ve communicated the objectives of your onboarding program to your organization, maybe it’s time to have that conversation. 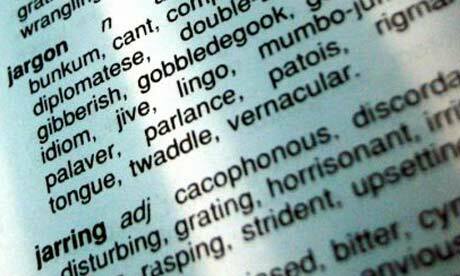 Your turn: What jargon is common around your organization? How do you clarify this jargon for your new employees?